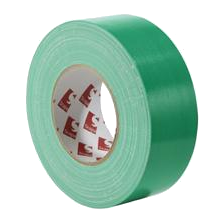 3120 is a medium performance, strong, polyethylene coated 70mesh, waterproof cloth tape, coated with a pressure sensitive adhesive. 3120 is available in a full range of colours including black, white, silver, red, yellow, blue and green. Exceed the technical requirements of PPP-T-60 TY.4 CL.1 / ASTM D TYPE IV, if advised on ordering. Packaging : bulk packed using interleaving sheets between layers. Note: Information on stock items, non-standard sizes, and lead times is available on request.